Leaf bags have arrived, and will be available for pickup beginning Monday at the Department of Public Works (1 Perina Blvd.) or in the Township's Clerk's Office (Town Hall, Room 107). The 30-gallon bags are being provided as a courtesy in preparation for this year’s leaf season, which begins the week of Oct. 21. The bags are available free of charge on a first-come, first-served basis, thanks to a partnership with RecycleBank. Bagged leaves can be placed at the curb on your scheduled trash collection day, giving residents more flexibility as to when leaves can be cleaned up. For more information on leaf-collection or the leaf bag program, please call the Department of Public Works at (856) 424-4422. My office was informed this week that PSE&G will resume overnight utility work along Brace Road, from Route 70 to Route 561, this Monday, Sept. 9. The road will be closed for repairs each night until further notice. Drivers should seek altenrate routes during work hours. These repairs are necessary in order for the New Jersey Department of Transportation to complete its resurfacing of the highway. My office will post more information as it is received on the Township website, and on Facebook and Twitter. Thank you in advance for your patience and cooperation. Cherry Hill Township and Springdale Farms are partnering for the first-ever Mayor's Wellness Day at Springdale Farms, from 10 a.m. to 4 p.m. next Sunday, Sept. 15. This free, day-long celebration of healthy living will feature free classes, hands-on activities, fitness and cooking demonstrations, information on healthy eating, health checks, raffles, and much more, for residents of all ages! Please join us for this new and exciting event as we kick off the Mayor's Wellness Campaign for fall. Admission is free, but we ask that attendees please bring a nonperishable food donation for the Cherry Hill Food Pantry. For additional details, including a full schedule of events, visit the Mayor's Wellness Campaign on Facebook. For more information, contact Jackie Caputo at Springdale Farms at (856) 414-1972 or springdaleinfo@juno.com, or Donna Dovey in the Mayor's Office at (856) 488-7878 or ddovey@chtownship.com. The Fall 2013 Community Magazine was delivered in homes across Cherry Hill last week, and registration is now open for upcoming Township classes, programs and events. The 32-page magazine contains a variety of news and photos from Town Hall, as well as a full listing of important events and exciting things to do in the next few months. This season's programs include something for everyone: Cartooning and clay animation for children; group exercises like pilates and jazzercise for adults; and lots of events for seniors. For more information or to register for a class online, click here. If you have not yet received your edition of the Community Magazine, please contact the Recreation Department at (856) 488-7868, or email Recreation@chtownship.com. 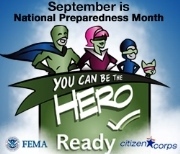 September is National Preparedness Month: Do you have a plan? If disaster struck, what would your family do? Where would you go? How would you get there? And if you became separated, how would you find one another? These are all questions that need to be answered before an emergency occurs. September is National Preparedness Month, and I would like to take this opportunity to remind all Cherry Hill residents of the importance of having a plan to stay informed and stick together in case of emergencies. FEMA and Ready.gov have made it simple to Make a Plan and and protect yourselves and your loved ones when disaster strikes. Click here for more information. Calling all photographers or those with a passion for photography! There is just one week left to submit your favorite photos for this year's "Focus on Cherry Hill" photography contest. The Cherry Hill Recreation Department will select the winning images to be used as the next cover images for the 2014 issues of the Community Magazine. The winning photos will also be featured during the 2013 Fall into the Arts Juried Photography Show at Croft Farm. Submissions will be accepted until 4:30 p.m. on Friday, Sept. 13. For more information, click here. Income-qualified Cherry Hill residents can receive help making certain home repairs through a deferred-loan program offered through Camden County's Department of Community Development. The program aims to help eligible homeowners address code-related items and weatherization needs. Covered repairs include, but are not limited to, electric, plumbing, heating, roof repairs, structural issues, windows, doors, handrails, carbon monoxide and smoke detectors, steps, and siding. Items are addressed by priority starting with the major systems. This program is administered by the Camden County Department of Community Development. For more information, click here. For additional questions or to apply, call (856) 751-2242. Cherry Hill Township and Springdale Farms are partnering for the first-ever Mayor's Wellness Day at Springdale Farms, from 10 a.m. to 4 p.m. next Sunday, Sept. 15. This free, day-long celebration of healthy living will feature free classes, hands-on activities, fitness and cooking demonstrations, information on healthy eating, health checks, raffles, and much more, for residents of all ages! Please join us for this new and exciting event as we kick off the Mayor's Wellness Campaign for fall. Admission is free, but we ask that attendees please bring a nonperishable food donation for the Cherry Hill Food Pantry. For additional details, including a full schedule of events, visit the Mayor's Wellness Campaign on Facebook [https://www.facebook.com/#!/events/536931589707133/551279461605679/?notif_t=like] . For more information, contact Jackie Caputo at Springdale Farms at (856) 414-1972 or springdaleinfo@juno.com [mailto:springdaleinfo@juno.com] , or Donna Dovey in the Mayor's Office at (856) 488-7878 or ddovey@chtownship.com [mailto:ddovey@chtownship.com] . The Fall 2013 Community Magazine was delivered in homes across Cherry Hill last week, and registration is now open for upcoming Township classes, programs and events. The 32-page magazine contains a variety of news and photos from Town Hall, as well as a full listing of important events and exciting things to do in the next few months. This season's programs include something for everyone: Cartooning and clay animation for children; group exercises like pilates and jazzercise for adults; and lots of events for seniors. For more information or to register for a class online, click here [https://reconline.cherryhill-nj.com/] . If you have not yet received your edition of the Community Magazine, please contact the Recreation Department at (856) 488-7868, or email Recreation@chtownship.com. If disaster struck, what would your family do? Where would you go? How would you get there? And if you became separated, how would you find one another? These are all questions that need to be answered before an emergency occurs. September is National Preparedness Month, and I would like to take this opportunity to remind all Cherry Hill residents of the importance of having a plan to stay informed and stick together in case of emergencies. FEMA and Ready.gov have made it simple to Make a Plan and and protect yourselves and your loved ones when disaster strikes. Click here [http://www.ready.gov/] for more information. Calling all photographers or those with a passion for photography! There is just one week left to submit your favorite photos for this year's "Focus on Cherry Hill" photography contest. The Cherry Hill Recreation Department will select the winning images to be used as the next cover images for the 2014 issues of the Community Magazine. The winning photos will also be featured during the 2013 Fall into the Arts Juried Photography Show at Croft Farm. Submissions will be accepted until 4:30 p.m. on Friday, Sept. 13. For more information, click here [http://www.cherryhill-nj.com/DocumentCenter/View/1834] . Income-qualified Cherry Hill residents can receive help making certain home repairs through a deferred-loan program offered through Camden County's Department of Community Development. The program aims to help eligible homeowners address code-related items and weatherization needs. Covered repairs include, but are not limited to, electric, plumbing, heating, roof repairs, structural issues, windows, doors, handrails, carbon monoxide and smoke detectors, steps, and siding. Items are addressed by priority starting with the major systems. This program is administered by the Camden County Department of Community Development. For more information, click here [http://www.cherryhill-nj.com/DocumentCenter/View/1857] . For additional questions or to apply, call (856) 751-2242.